Trends ebb and flow in the custom world. And with them, the fortunes of bike builders. It might be tough at the top, but it?s even harder to stay there over the years. Japanese builder Hideya Togashi is a man with more staying power than most. He took his first Best Of Show award from Mooneyes in 2006, and he’s collected several more over the years. And if you look closely at his latest Harley ironhead build, it?s easy to see why he is so fêted. Togashi-san runs Hide Motorcycle (pronounced ?Hee-day?) and this 1966 XLCH Sportster was one of the stars of the latest Yokohama show. The refurbished engine is all that remains of the original bike, and it?s in original condition, right down to the Linkert DC-7 carb. The ?CH? designation refers to a slightly higher compression-ratio version of the XL engine?legend says that it stood for ?Competition Hot,? but we?ll take that with a pinch of salt. It?s a beautiful V-twin, and capable of pushing a Sportster to 115 mph (185 kph), but the real action is elsewhere. ?To be honest, I didn?t have a concrete concept or theme before I made this bike,? says Togashi-san. ?As always, I cherish the balance, and maximize the beauty.? When he exhibits at the Mooneyes Show, Togashi takes a very particular approach. After all, the bike needs to looks good in a custom show environment as well as on the road. ?I’ve combined the ?show off? elements that are required for the venue, with street elements that the owner can fully enjoy while riding on a winding road,? Togashi says. Top echelon Japanese craftsmen spare no effort on their builds, but they step it up a gear further for the big shows. So Togashi made the hardtail frame for this Sportster from scratch, using a single downtube design. Only the frame number plate is grafted on from the original frame, and the finish looks genuine?despite the nickel-plating that Togashi has added. Under the skin, the forks and triples and steering head are stock, but have been sleeved and cleaned up for a smooth custom effect. A wraparound headlight nacelle, hand-beaten from aluminum sheet, adds to the sleekness. It took many attempts to perfect, and Togashi has hidden the headlight itself behind a simple grille. He?s taken the front wheel up a couple of sizes to 21 inches, but the 18-inch rear is the same as when it left the factory. And the drum brakes, cleaned up and devoid of surrounding paraphernalia like fender struts and shocks, look stunning. 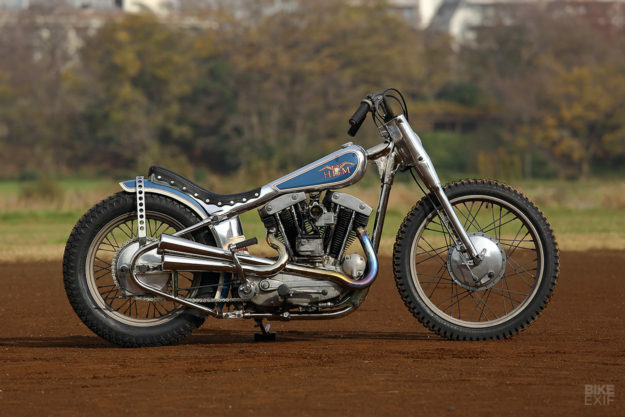 With the stance of the Sportster sorted, Togashi turned to the bodywork. He?s used aluminum for the tank, with a finish good enough to leave as raw polished metal on the top surfaces. ?It?s a good balance with a nickel-plated frame and polished metal,? he says. ?We did not dare polish the engine or the wheels: their matt finish adds contrast to the frame and bodywork. ?